I wasn’t sure what to expect when meeting an animal that weighs over 2 tonnes. Let alone having a mud bath with them. This was one of the most memorable experiences in my trip to Thailand. I was super excited to cross this off of my bucket list. I finally got to live out my dream and experience elephants up close. The gentle giants played a huge role in my absolute obsession with animals growing up. Desiree and I went to book our excursion out to the very popular Elephant Nature Park. But it was completely booked out until the next month! Determined, I went to work to find an alternative. Online I stumbled across Elephant Jungle Sanctuary. The excursion offered a roundtrip shuttle service from our Hotel, lunch and a full afternoon with the elephants. I let out a huge squeal as I quickly booked in the trip two nights before we were set to go. Our ride out to the facility was great! Desiree and I sat in the truck with a buddy we made on the trip who was also staying at our hotel X2 Vibe Decem. The other guests sat on the outside of the truck in the bed which was converted with benches and a cover. I was given the task of car DJ and blasted 112 and Diddy as we drove about 90 minutes to the sanctuary (with a 15-minute break on the way). We pulled into camp #5 where there was already a beautiful Asian elephant at the entrance. I stared at the freckles that covered her nose as I excitedly asked a staff member if I could touch her and say hello. When I was given permission I could barely hide how happy I was as I reached a hand out to her. She wasn’t having it and strolled away but then returned for a little loving in a few minutes. I later found out that she was 73 years old (the same age as my mum’s aunt!). The auspicious encounter had me ready for the rest of the day. Our group was gathered and shown to little lockers where we could put our bags. While it wasn’t a secure area with combination locks, I felt that my stuff was safe among the crowd we were with. We were then given a bin of shirts with deep pockets to wear and sat for instructions. We received an introduction to the facility and the staff there. 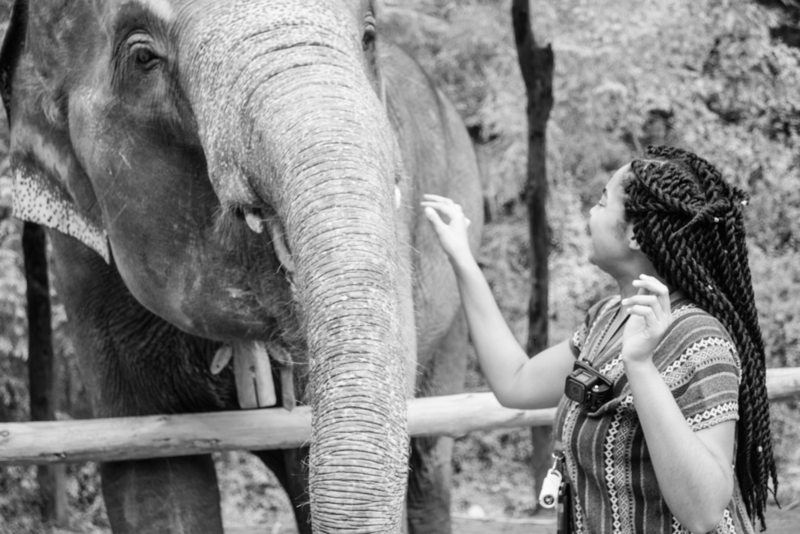 It was cool to learn how to interact with the elephants and feed them bananas. During the brief presentation, one of the elephants climbed over the fence and started to strut over to where we were seated. We laughed as one of the staff members wrangled her away gently and chastised her naughtiness. 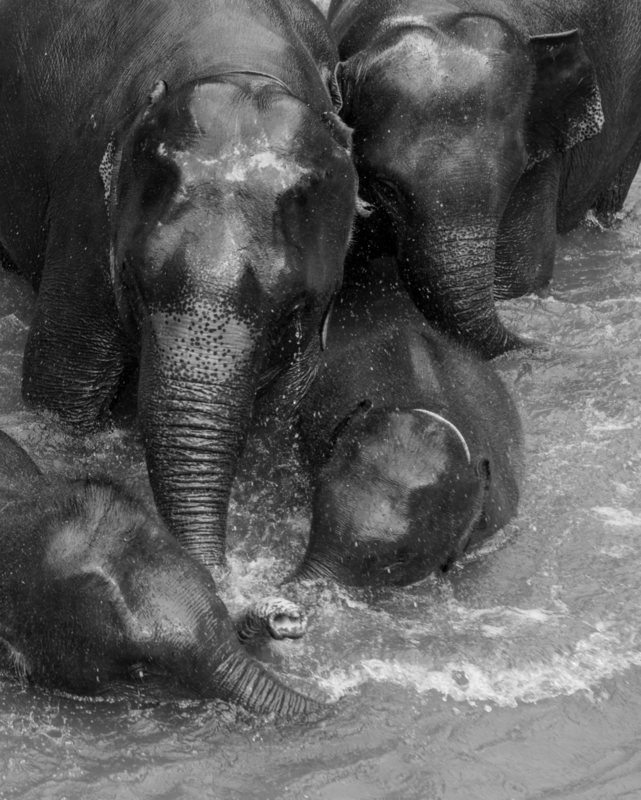 I later learned that many of the elephants were cheeky and had incredible senses of humour. Suddenly it was time to meet the herd of elephants. As we approached we saw a baby elephant in the mix (who was 1 year old). We were told to dive into bins of bananas and fill our pockets. 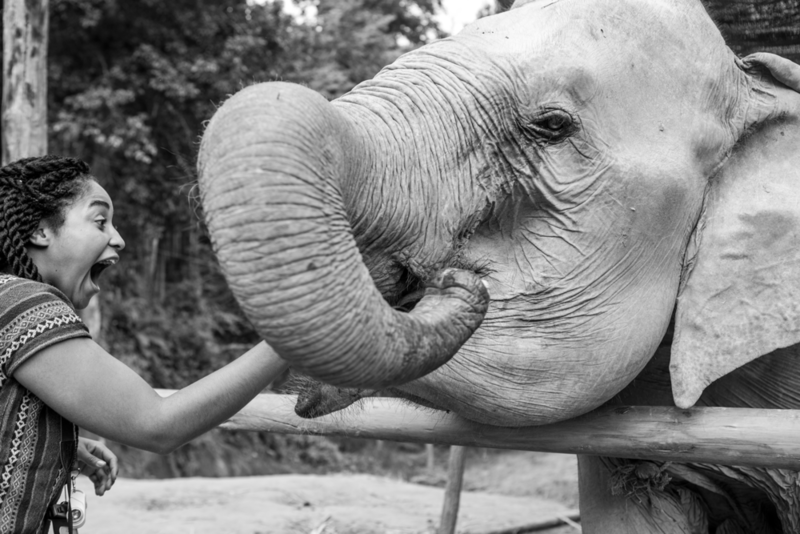 Our first activity was to build trust and a relationship with the elephants. We did this by feeding them bananas and greens. My hands were covered in slobber and I wore the biggest grin. With mouths wide open and trunks at the ready, the elephants gladly ate all of the bananas we had to give. Before this magical excursion, I worked with animals and in animal facilities for several years. I had the chance to interact with birds, dogs, cats, rodents and more. I’ve always had an affinity for living creatures (even lizards and snakes…and I still want a turtle, guys). I felt like I was missing out because I am not a fan of zoos. There’s only so many videos on the Animal Planet YouTube page. This was an amazing chance to visit large free-roaming animals that are receiving incredible care and daily love. Yes, the elephants are still an attraction, however, at this facility, they are free roaming and live within the safe borders of the canopy of trees. After the feeding, we changed and took a slippery trip down a muddy hill. We grabbed slops of mud for the elephants and coated their bodies with it. It was half gross half awe-inspiring. Soon we headed over to a gentle river where we bathed with them. This was my favourite part. We hopped in the water armed with buckets and purpose. The staff were super playful but also full of elephant tidbits. After we worked up some big appetites we went to have some lunch. The simple rice dish was sweet (like many Thai foods) and filling. I left Elephant Jungle Sanctuary with a renewed appreciation for elephants. Would you try this experience? Let me know in the comments below!